Partners in fostering innovative solutions that promote sustainable agriculture and rural development. Many of the 56 Islamic Development Bank (IDB) countries, concentrated in North and East Africa, the Middle East, and central and South Asia, are in some of the most water-scarce areas on earth. Renewable water resources are nearly fully exploited, and non-renewable water resources, e.g., ancient groundwater aquifers, are being rapidly depleted. The rural poor suffer the most from water scarcity, because they lack political or economic influence, or the financial resources to buy water services. When water supply, sanitation or irrigation services fail to reach them, their livelihoods and health are seriously compromised. 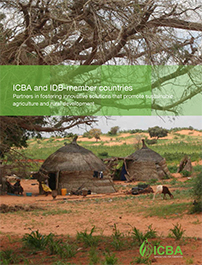 Originally established in 1999 as a research and development institute focusing on the problems of salinity and using saline water for irrigated agriculture, the International Center for Biosaline Agriculture – ICBA has evolved over the last 15 years into world class modern research facility with a team of international scientists to conduct research on improving the well-being of poor farmers cultivating under marginal conditions. Strategically the Center has broadened its initial focus on applied research and technology development in saline irrigated agriculture to a broader and more integrated approach to strengthening the agricultural sector and identifying sustainable solutions for food and water security in marginal environments.